Theresa May is meeting her divided Cabinet to discuss the Brexit deadlock after Brussels warned a no-deal outcome is “more likely than ever before". 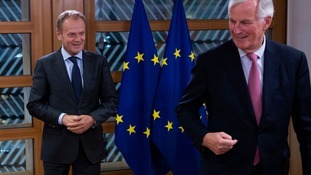 The Prime Minister has insisted an exit agreement is still “achievable”, despite negotiations stalling just days ahead of a key summit. A group of Cabinet ministers met on Monday evening to discuss the developments, with Foreign Secretary Jeremy Hunt, Brexit Secretary Dominic Raab and Environment Secretary Michael Gove among those who attended, it is understood. On the eve of the summit, Germany's Europe minister Michael Roth said his message to Mrs May was: "Take responsibility and be constructive." “But at the same time, responsible as we are, we must prepare the EU for a no-deal scenario, which is more likely than ever before."